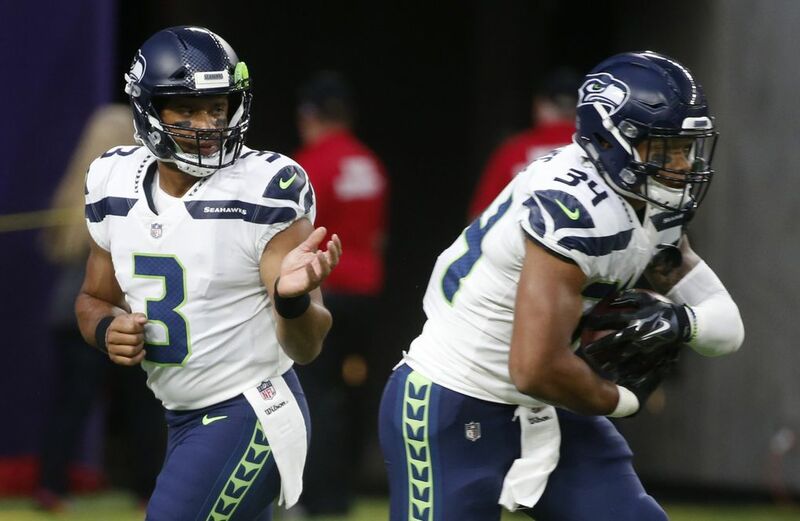 The Seahawks dropped to 0-3 in the preseason, but Russell Wilson & Co. used an efficient offense and bend-but-don't-break defense to take a lead with its starters. 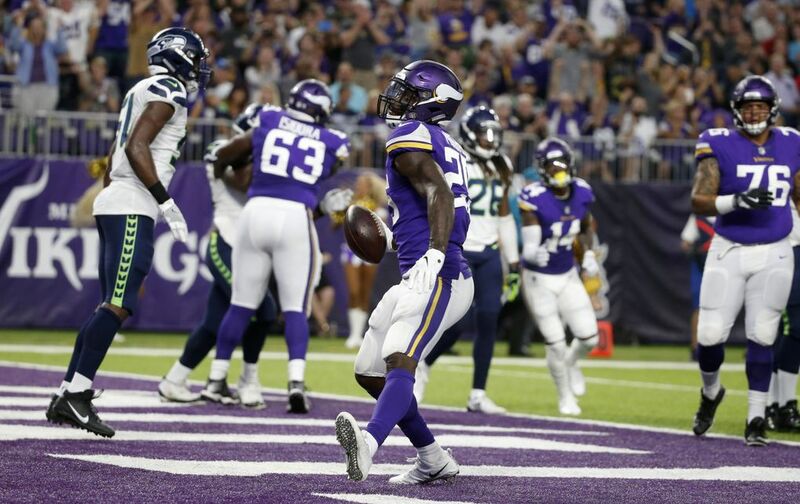 What Carroll and the Seahawks didn’t get was a win, as the Vikings scored with 47 seconds left on a 25-yard pass from Kyle Sloter to Chad Beebe and converted a two-point play to take a 21-20 lead and held on, dropping Seattle to 0-3 on the preseason. 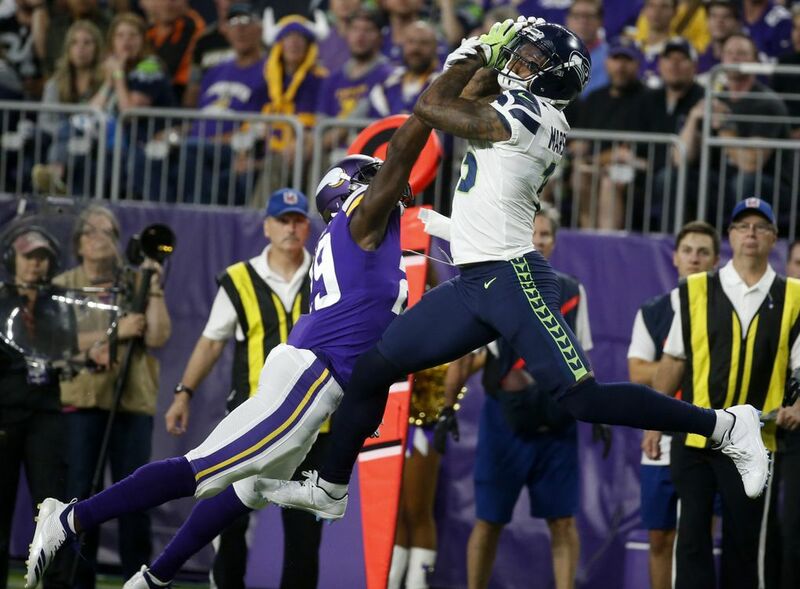 That came after the Seahawks had taken the lead on a 36-yard pass from rookie Alex McGough to second-year receiver David Moore with 4:10 left. 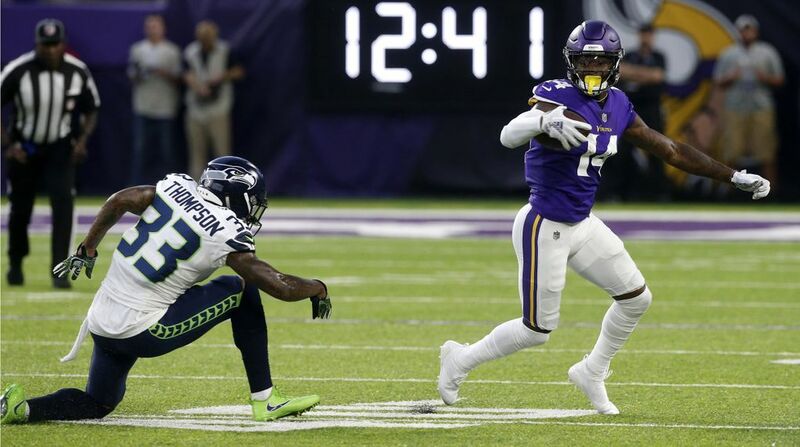 Moore had an apparent 75-yard punt return for a touchdown a few minutes later that was called back for holding in a performance that seemed to further solidify that he will make the roster. 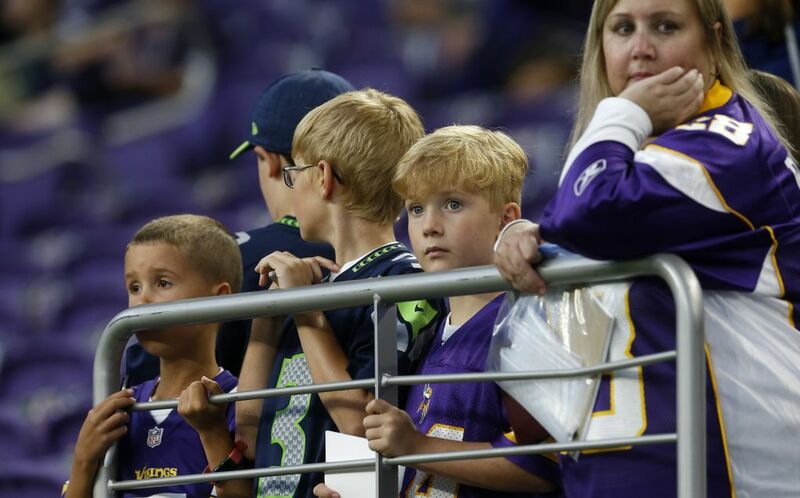 Seahawks coach Pete Carroll following Friday’s game against the Vikings. 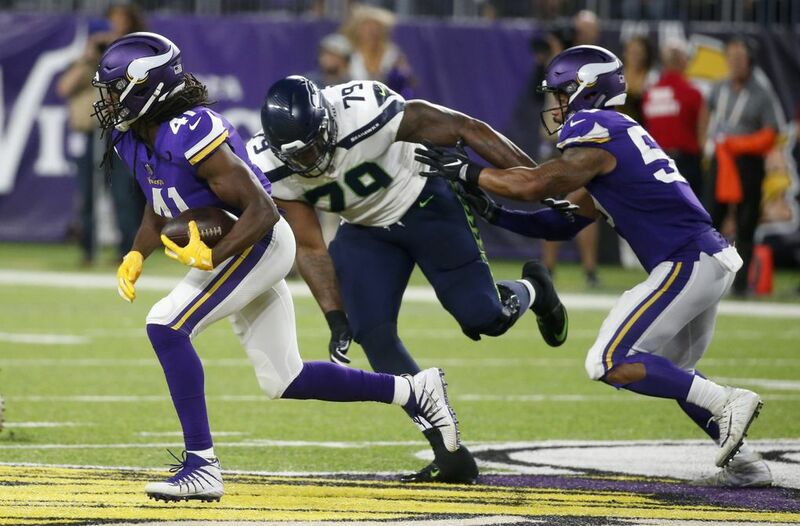 But what Carroll liked the most was the Seahawks having a 13-6 lead when the starters (or most of them, anyway) left the field midway through the third quarter against a Vikings team that is among the Super Bowl favorites entering the 2018 season. 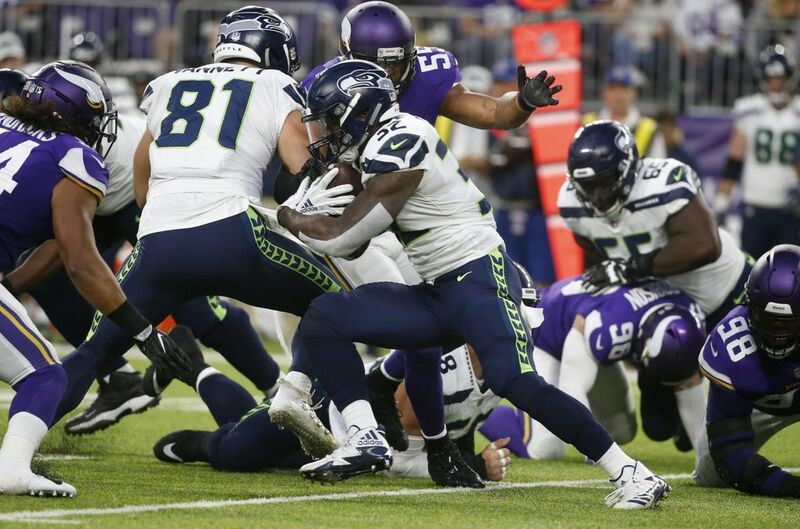 The Seahawks did it with a recipe of running, stopping the run and special teams. “I really liked the way we played tonight. I thought we gained a lot of ground in areas that were important to us,” Carroll said. Here’s what Carroll specifically liked out of his starters. 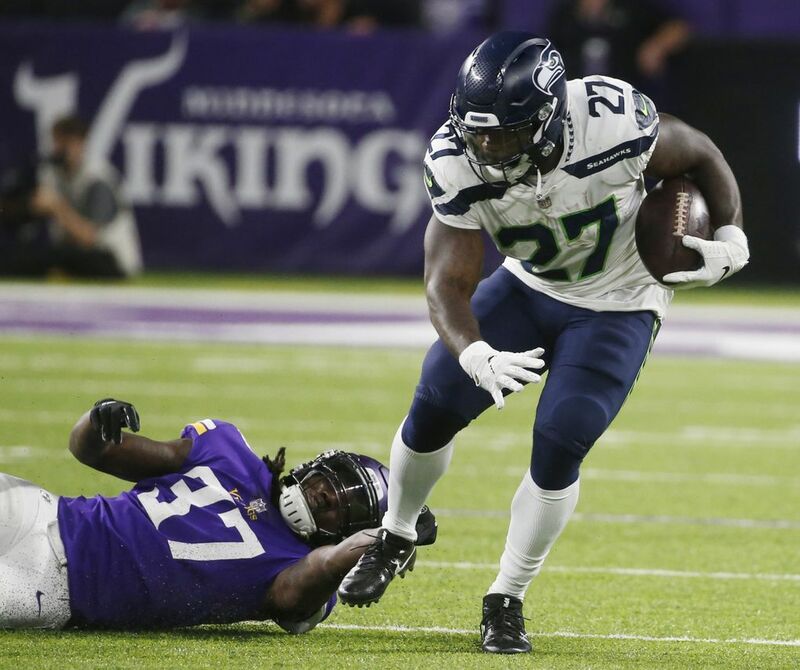 You may have heard that reviving the running game is one of the Seahawks’ main goals for the season. Friday gave the most evidence yet that things may be trending in the right direction. 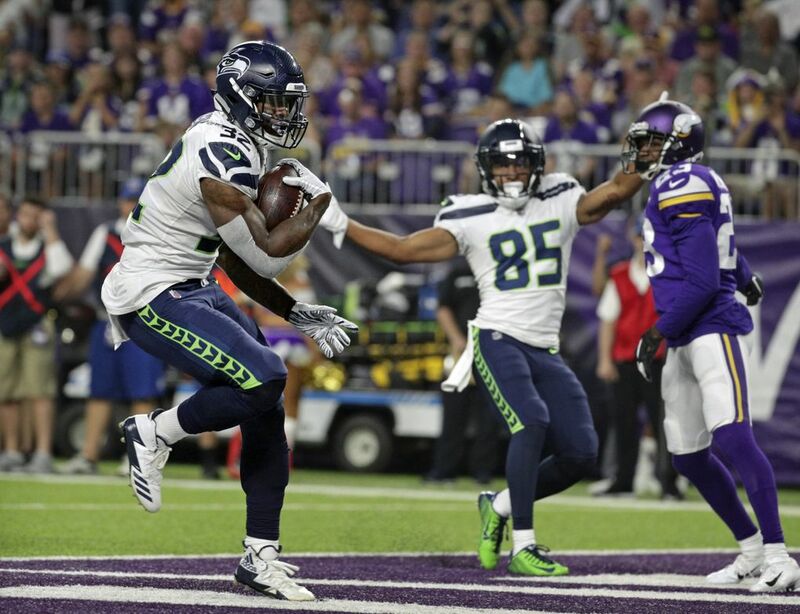 The numbers weren’t overwhelming when the starters were on the field, but they were solid as Seattle had 60 yards rushing on 14 attempts during the six series Russell Wilson was the quarterback and most of the offensive starters were on the field. 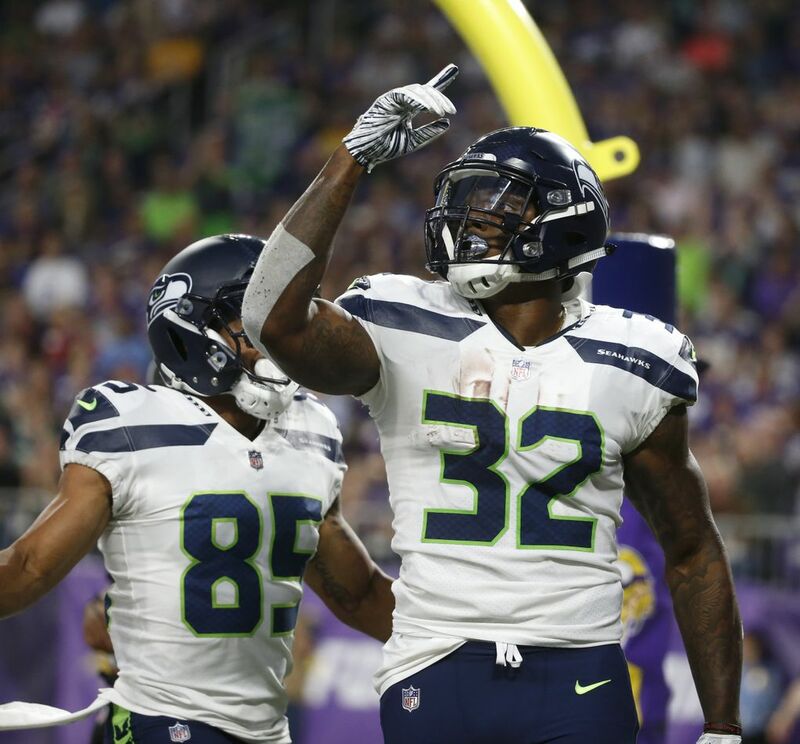 That included 55 yards on 13 carries — a 4.2 yard average that Seattle will take — by the tailbacks Mike Davis (29 on six) and Chris Carson (26 on seven). That also included a 6-yard TD run in which left guard Ethan Pocic pulled to help clear a path over the right side for an easy score. 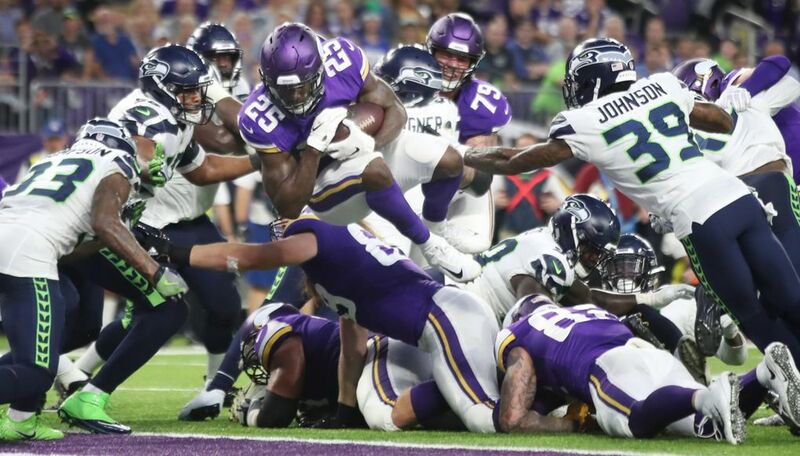 Carson has 86 yards on 19 carries in the preseason. 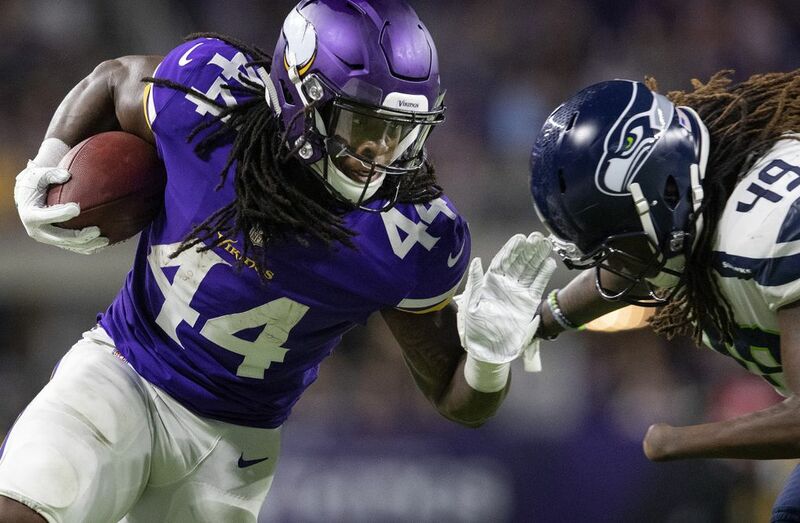 That’s an average of 4.5 yards per attempt with a long of 12, the kind of grind-it-out running that Carroll wants to get back to. 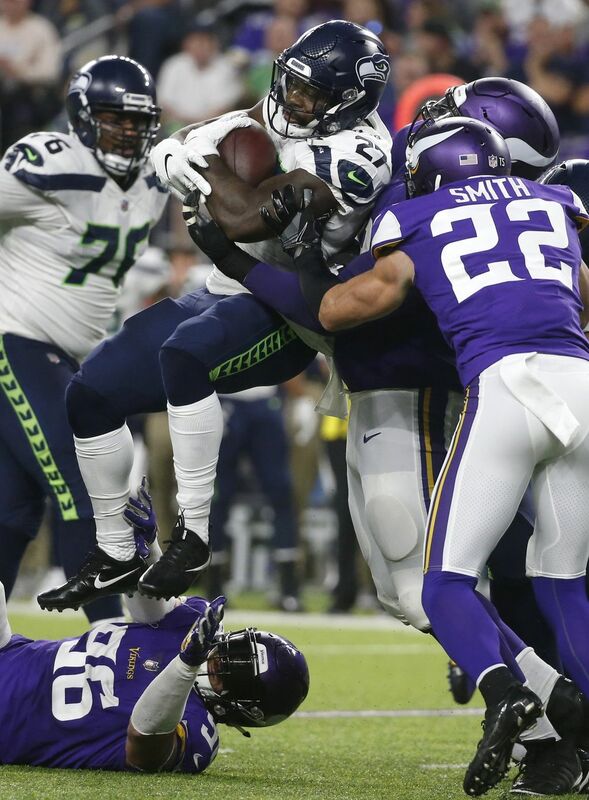 “I thought it looked pretty clean,” Carroll said. 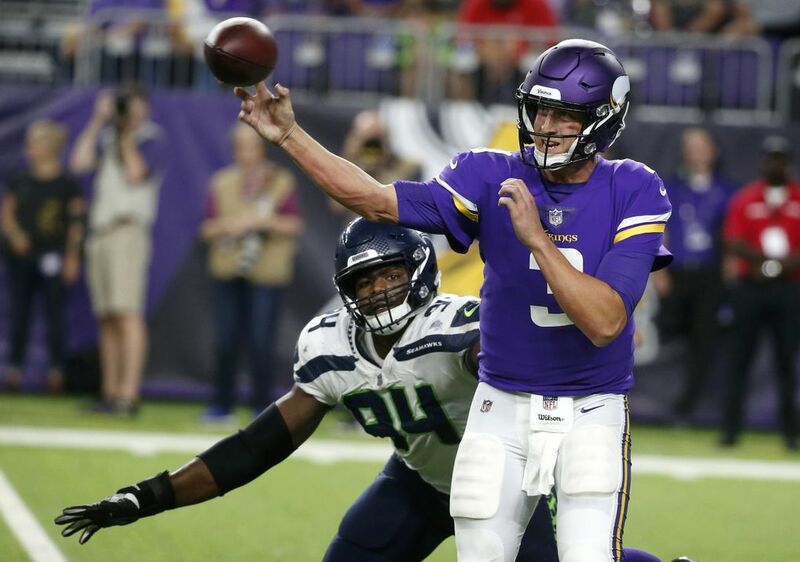 Wilson’s overall stats also weren’t earth-shattering — 11 of 21 for 118 yards. 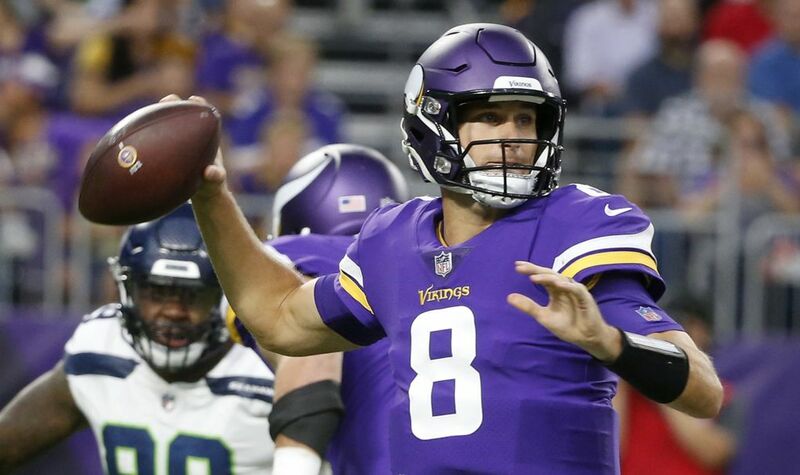 But he was at his best during a 12-play, 75-yard drive that resulted in the only touchdown for the six series that he led, completing 5 of 7 passes for 52 yards. 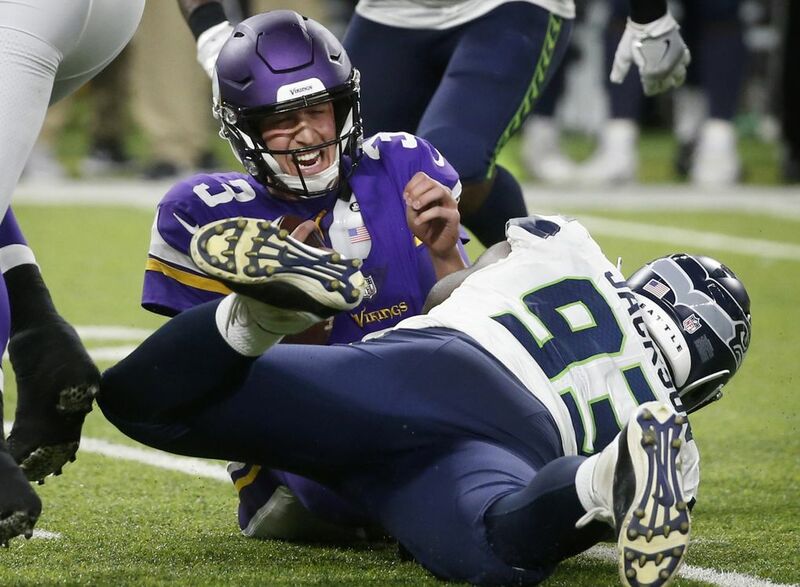 Wilson has been sacked just twice in 13 possessions in the preseason and while the preseason is the preseason, Wilson said he thinks it’s meaningful. “Today was an exciting day and we’ll just continue to show that the line is getting better and better,” Wilson said. 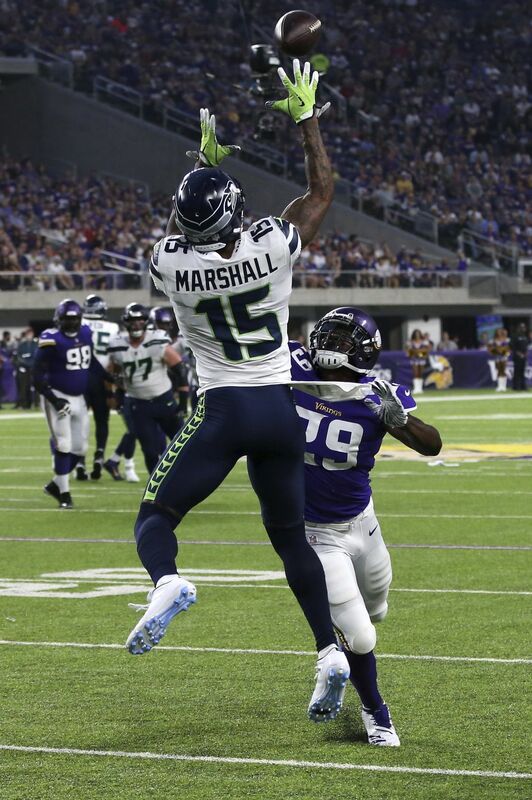 Three of his completions (for 34 yards) went to veteran Brandon Marshall, who likely put to rest any doubt about whether he’ll be on the team. Marshall got all of his completions against Minnesota’s standout corners, Trae Waynes and Xavier Rhodes. 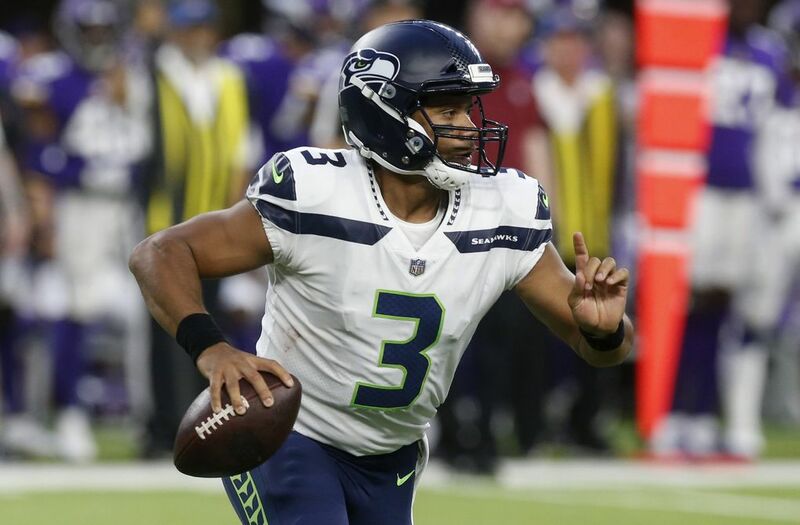 Wilson is 28 of 47 for 354 yards, one touchdown and no interceptions in the preseason and is likely to get only one or two more series in the finale against the Raiders on Thursday. 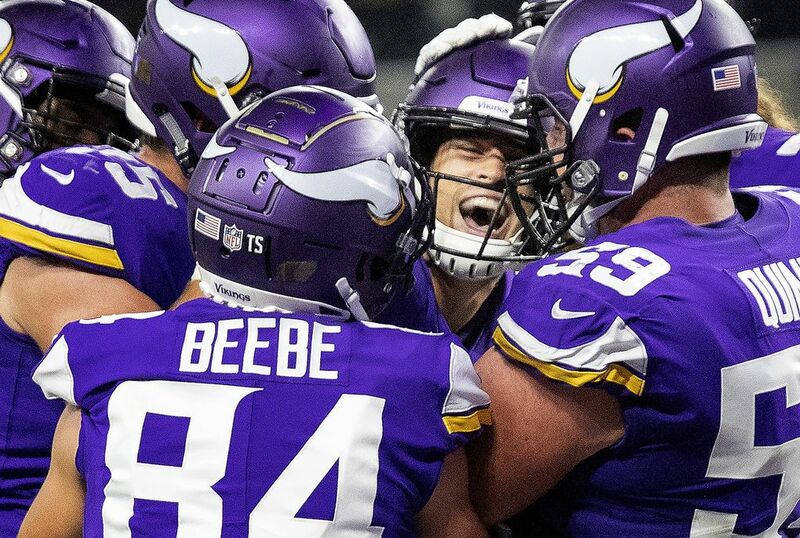 That’s a 90.2 passer rating. 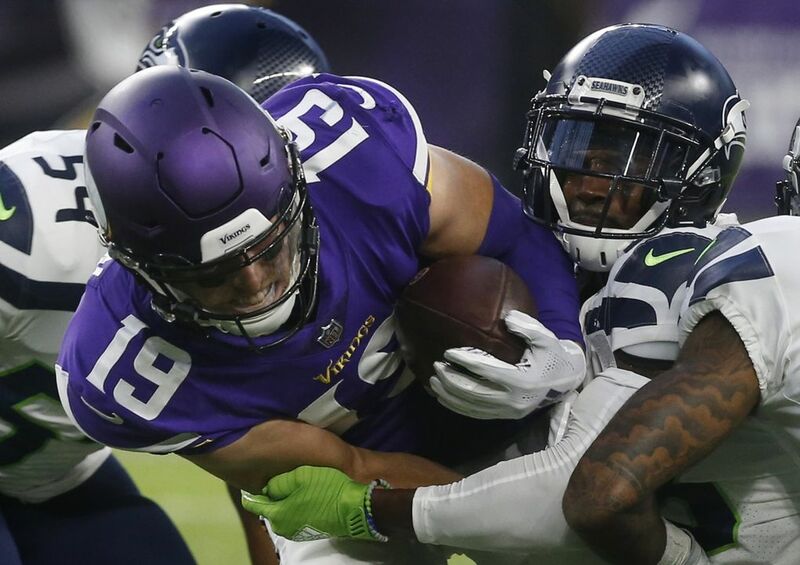 which is below the 95.4 of last season but has come without Doug Baldwin for all of the preseason, Tyler Lockett the last two games and projected starting tight end Ed Dickson. 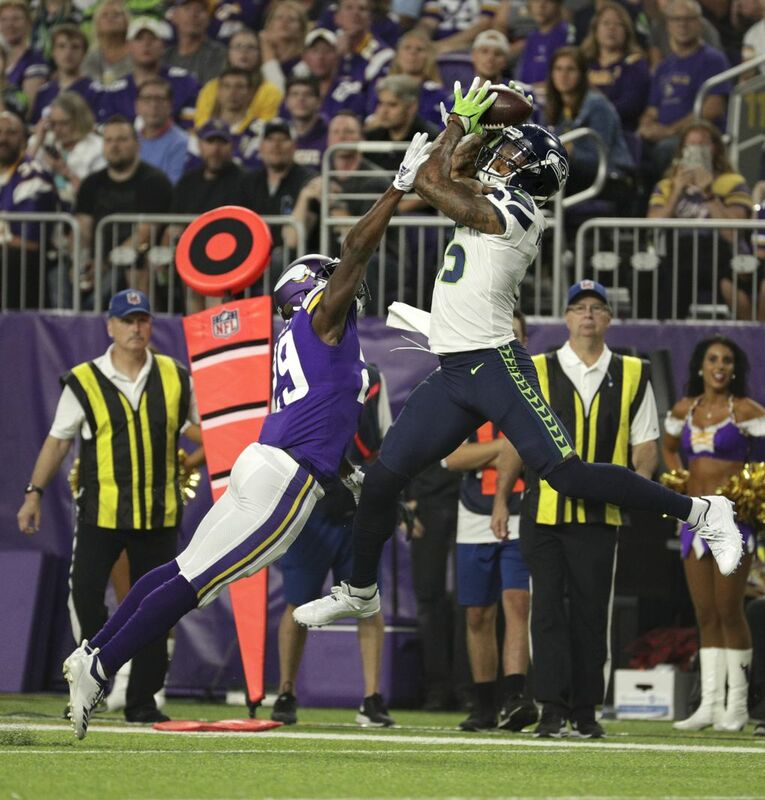 The Seahawks scored TDs on just two of those possessions, and the Seahawks will need to be better there when the regular season begins. 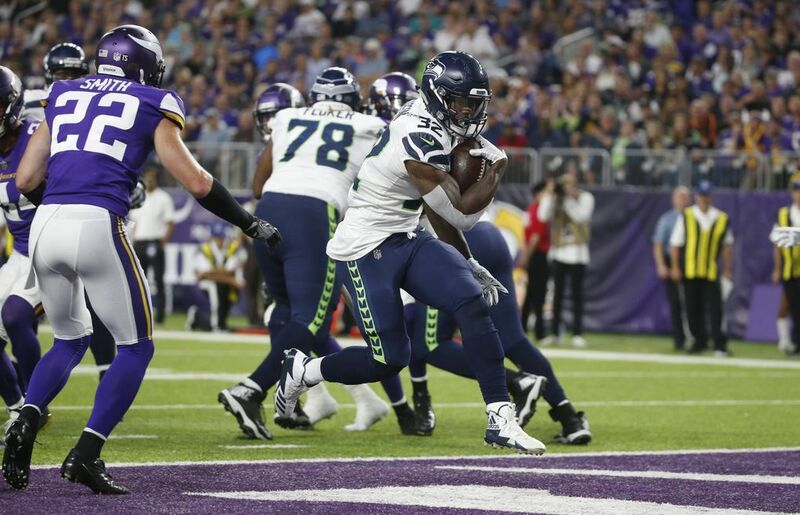 But Baldwin’s return and the Seahawks taking the running reins off Wilson will help. 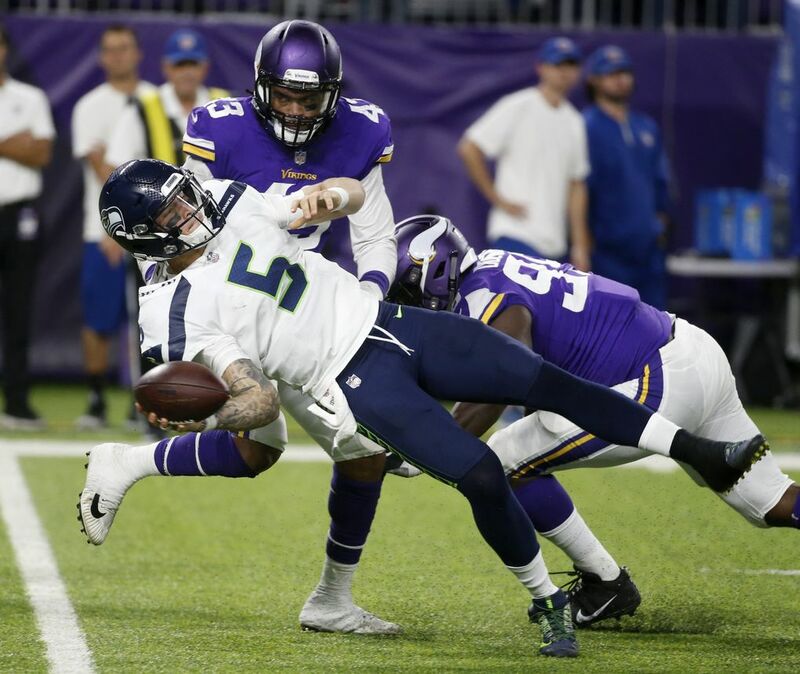 “I definitely think we are ready (for the regular season),” Wilson said. 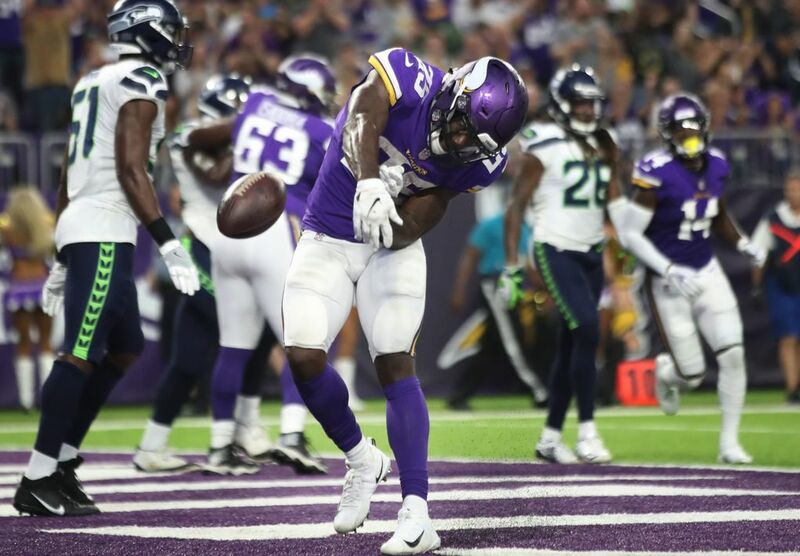 Minnesota gained 209 yards in the first half when its starting offense played against what was most of Seattle’s starting defense. 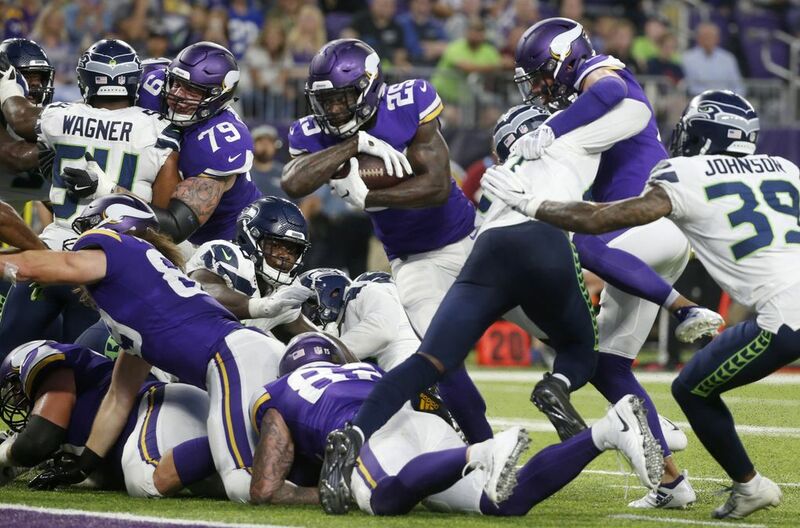 The Vikings also converted 7 of 10 third downs, which Carroll said “was our biggest problem of the night,” and the Seahawks didn’t have a sack or a turnover. 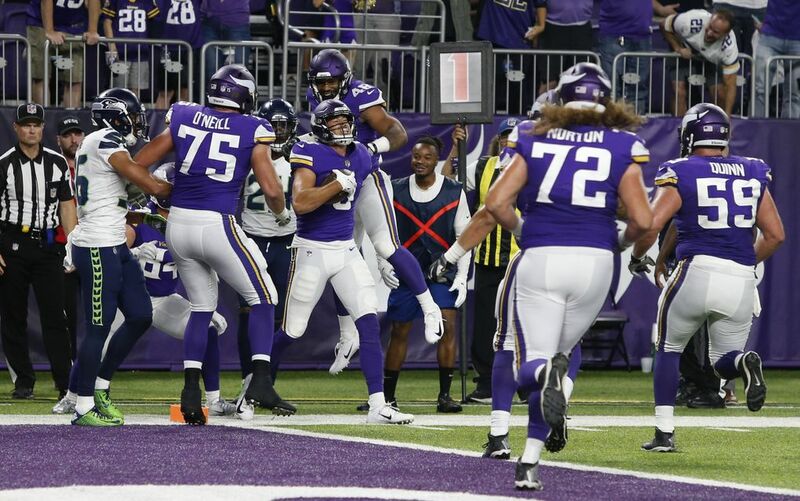 But the Seahawks made the Vikings go the long way with good special-teams play, notably a 57-yard Michael Dickson punt that was downed at the 3. 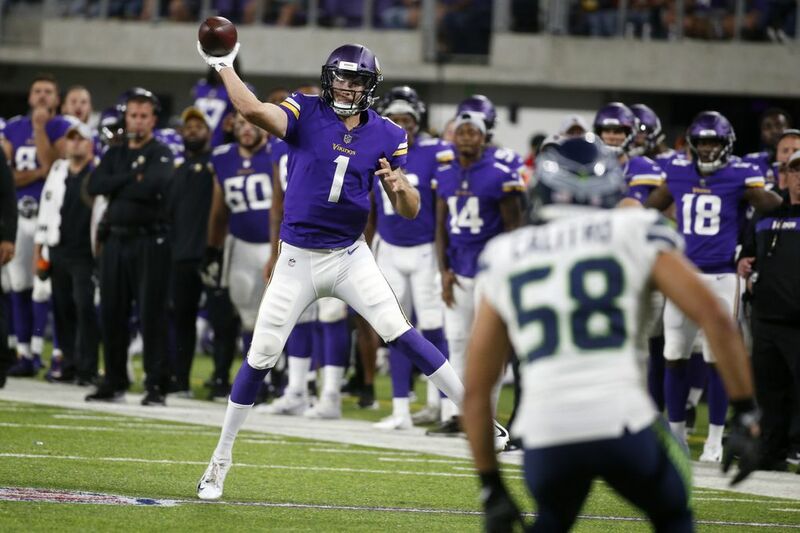 Minnesota’s other first-half drives started at its own 22, 25 and 17, the kind of field management Carroll likes. 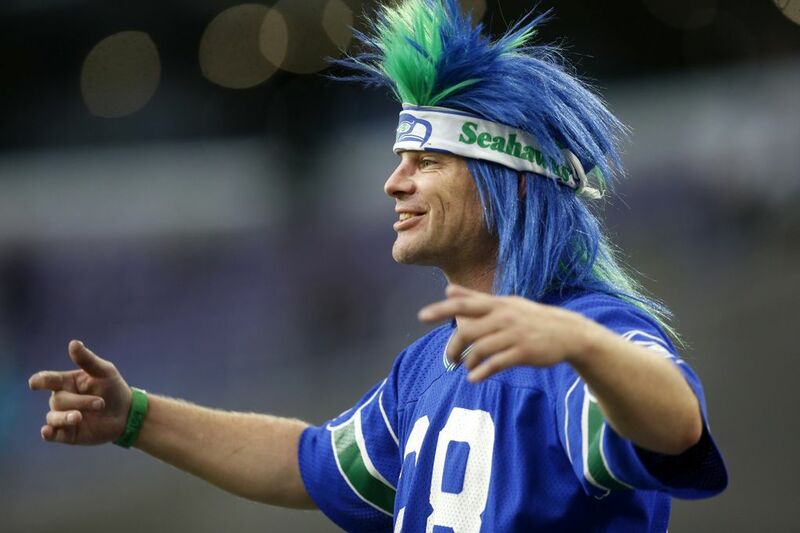 “That’s fantastic football,” Carroll said. 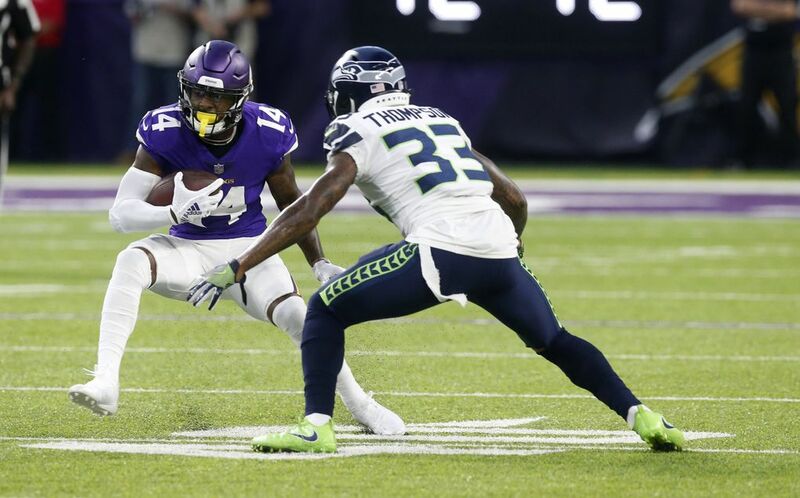 The Vikings drove 97 yards for a touchdown following the Dickson punt thanks in part to a holding call in the end zone on Seattle corner Shaquill Griffin on what appeared to be a third-down stop. 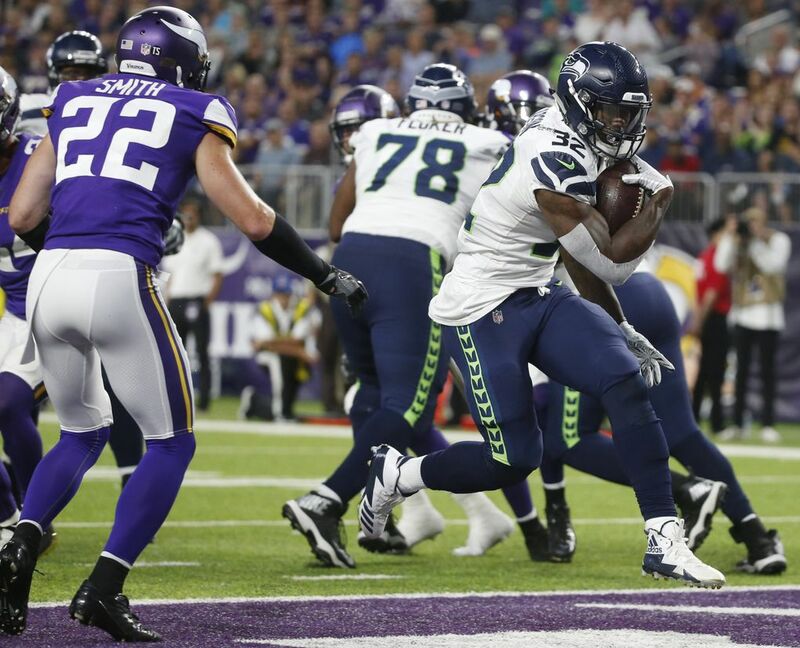 The Seahawks twice forced stops at the Seattle 24 with Minnesota rookie kicker Daniel Carlson missing 42-yard kicks each time. 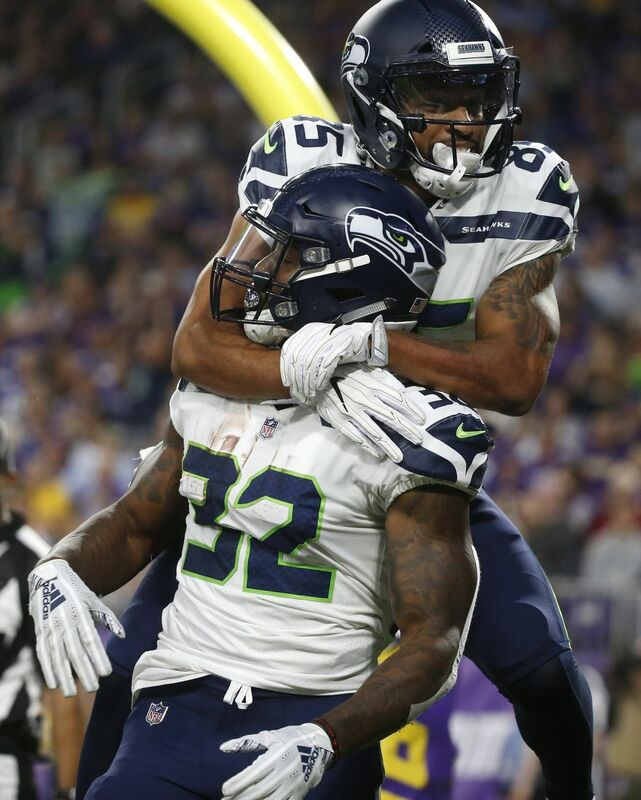 But Seattle giving up some yards early and putting down the clamps when it had to has long been part of what the Carroll-era Seahawks do. 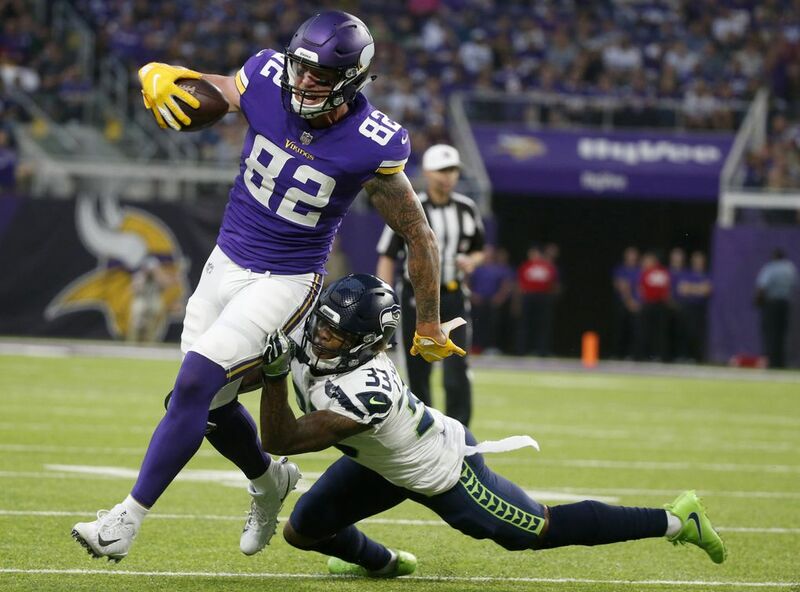 While the Seahawks gave up yards to QB Kirk Cousins — who was 17 of 28 for 182 yards — they were stout against the run, allowing the Vikings just 27 yards on 13 carries in the first half. 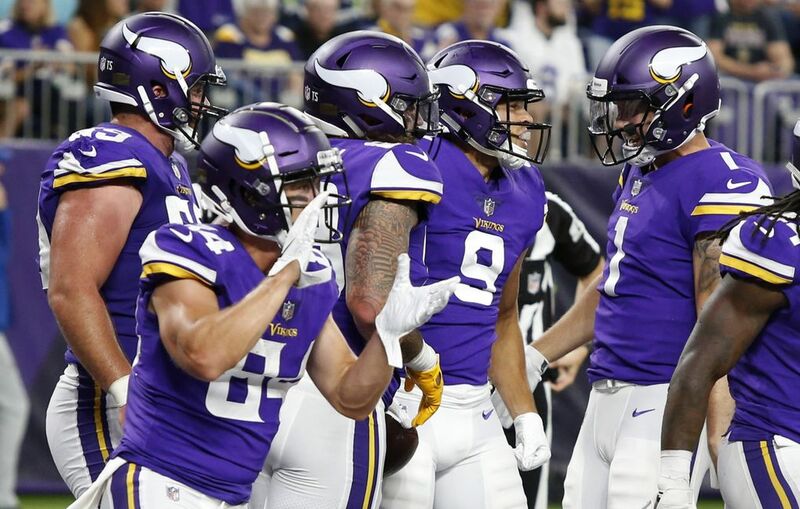 “This is a team that wants to run the football, and they were dedicated to running it, and they were trying and our guys held up really well,” Carroll said. 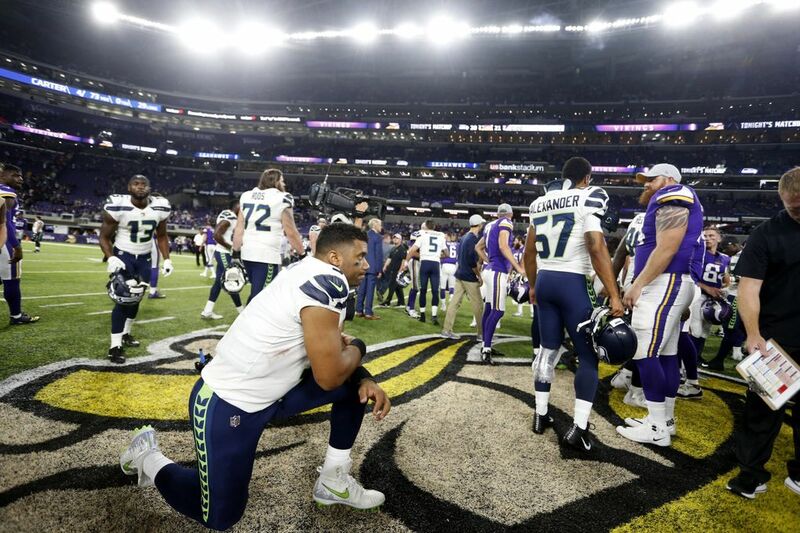 To middle linebacker Bobby Wagner, who along with K.J. 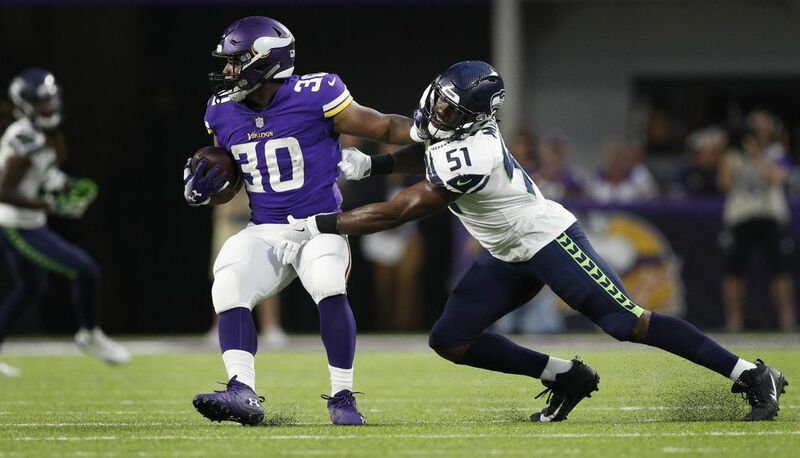 Wright is one of just two defensive players left from the Super Bowl winners of 2013, it was an echo of the good old days.